The Specialized Tarmac Disc Expert is one of the biggest new road bike releases of 2019. Although it isn't the cheapest on offer, it justifies its price with a potent concoction of performance and comfort, with the sort of finishing kit (rims, bars and saddle) that will ensure longevity without impeding on those Strava Segment wins. Warmer temperatures and longer days are just around the corner, meaning hordes of large-legged individuals in ultra-tight garments will soon be hitting the open road in a quest to blow away the cobwebs and put the winter turbo training into practice. As with every new season, there has been an avalanche of new road bikes enter the market, from the extremely affordable metal-framed variety to the painfully expensive lightweight carbon fibre weaponry you see twinkling away in boutique bike shop windows. If you're looking to pull the trigger on a really serious road bike, the Specialized Tarmac Disc Expert should be top of your shopping list. Let's start with arguably the most important part of any performance road bike: the frame. Here, it is fashioned from Specialized's spanking new FACT 10r carbon, which has been layered to offer the kind of pointy, power transfer favoured by professional cyclists without resulting in years of crushing debt. The Tarmac Disc Expert also flies the flag for the marque's 'Rider-First Engineered' ethos, which sees all seven frame sizes offer the same structural rigidity and resulting responsiveness. Performance is immediately tangible when out on the open road, as this ultra-responsive set-up gives plenty of confidence through tight corners, while the overall construction makes the most of power transfer. Weeks spent in wind tunnels also ensures excellent aerodynamic chops, with this demon effortlessly slicing through the air like a hot knife through butter. It is a little disappointing not to receive electronically-assisted gearing at this price point but Specialized has played things very safe with the near-bulletproof Ultegra R8000 set-up. Gear changes are precise and speedy, while miles and miles of hard riding can't seem to knock the indexing out of position. This is a gearing system that requires very little maintenance and one that you can happily rely on to cope with even the most demanding weekend rides. Perhaps most importantly, this Expert model comes with a set of Roval C38 carbon, which effortlessly freewheel and perfectly partner with the lightweight and responsive frame to offer a winning package. Our test model also came decked out in a new black, white and grey camouflage paint job, complete with contrast orange lettering. It looks like nothing else on the market today and we instantly fell in love with it. Handlebars, saddle, tape and tyres are all taken care of by Specialized's in-house components and they are all largely excellent. Winter riders may want to consider an upgrade on the tyre front but both the saddle and the cockpit offer an excellent compromise between comfort and performance. Everything about this bike felt right from the minute I swung a leg over its attractive frame, from its racy-yet-surprisingly-comfortable geometry to the way its Roval rims want to effortless roll along the road. Initial set-up took hardly any time at all, as a quick adjustment of the saddle and bars resulted in a ridiculously comfortable seating position, allowing the Tarmac Disc Expert's many facets to immediately shine through. Power transfer through the Shimano Ultegra cranks is excellent and the responsive front end makes it easy to throw in and out of corners with confidence. Disc brakes have always seemed a little overkill on a road bike, as most enthusiasts try to limit the time on the anchors as much as possible, but with a weight penalty of just 290g from these ultra-sharp disc options, it feels archaic heading back to standard calipers. Braking is smooth and linear, while feathering the responsive levers makes it easier to trim a line or gently scrub off speed without the risk of flying over the handlebars. This is a bike that just begs to be ridden, even when the weather outside conspires against the Lycra illuminati, and one that draws myriad admiring glances wherever it does. I would suggest investing in a decent lock or three, simply because there will be numerous light-fingered folk wanting to get their hands on this seductive steed. It's one of the best road bike experiences I've had. 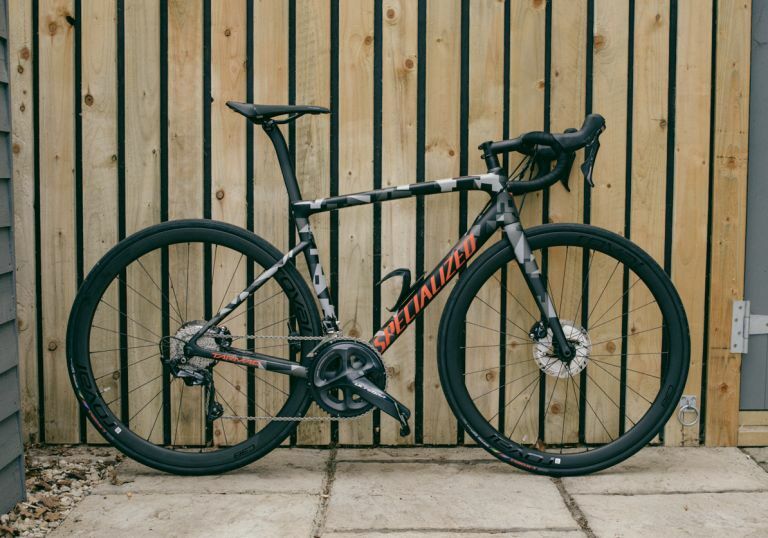 For most people looking to buy a bike, it's complete overkill but for a certain, very enthusiastic niche market, the Specialized Tarmac Disc Expert will be akin to a Holy Grail.